The recently launched E35ss 'Crusader' has come storming onto centre stage with an outstanding performance blasting 2hrs off the previously held 35ft record for the Coastal Classic. 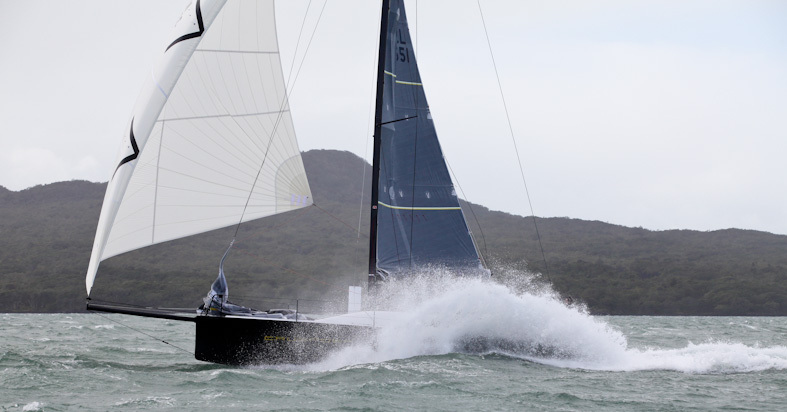 The Coastal Classic is our biggest race of the year in New Zealand with often over 200 boats on the start line. This year was set to be a record breaker with a 35-45kt SW forecast which would be a fast 110-130TWA reach. I was fortunate enough to hitch a ride on the brand new Elliott 35ss canting keeler ‘Crusader’ after we decided to pull the pin on my brother's 8.5m trimaran due to the extreme forecast. Man what a ride, I had never sailed on the boat before but were good friends with a lot of the crew and had a bit to do with the full North Sails inventory that we had just put on. We had a conservative start, opting to 2 sail to north head and be one of the first to gybe towards rangi light. The other boats that had set big gear to try and get away were either on their side down and kicking or blasting off in the wrong direction in the 25-35kt breeze. After our gybe we set the fractional furling A5 (with a reefed main) and I instantly got a real feeling of the potential of this boat as we leapt up to 22-24kts of boatspeed comfortably. At this stage we were amongst the 50ft fleet and having a ball. We watched a 40kt squall come down and flatten most of the fleet but opted to hold on and try and ride it through as we felt pretty comfortable. When it hit we were underwater. 42kts with a kite on is not really ideal so we bore away and furled it. Still sitting on 18-24kts 2 sail reaching towards tiri with 30-35kts at 125TWA. Further down the track we changed from the #4 jib to the J2 with a reef point and from then on it we went between the reefed and full jib in the very changeable 25-45kt breeze. We decided on going outside the hen and chicks, slightly further in distance but a more steady breeze and didn’t see the point coming up 20 degrees to go inside. It think was the best route as it often is in a planning boat in SW conditions. The boat was just incredible, sitting on sustained speeds over 20 and regularly hitting 24-25kts with a peak of 25.8kts although we might have gone faster in the first big squall with the A5 on, no one really had a chance to look. We managed to hold off the class 40 ‘Buckley Systems’ for the 15nm beat into to the finish even with a few small technical issues we had and finished at 8:02pm still in daylight smashing 2 hrs off the previous 35ft record and 30minutes off the 40 ft record with an overall record time of 10hrs 2min 51seconds. We only had a kite up for a total of about 15minutes for the whole 10hr race and the wind was generally around 100-120TWA so a pretty tight 2 sail reach. Overload the smaller Elliott 9 super sport canter still holds the record for under 30ft of 10hr 23min 56seconds that they set in 2009 and were not far behind in this race when they had rudder issues and withdrew from the race. Worth noting that until the 100ft Supermaxi ‘Alfa Romeo’ smashed the overall race record in 2009 the overall monohull record was also held by another Elliott designed boat the radical 50ft Schooner ‘Primo’ which held the record since 1996. Well done to the Orma 60 ‘Vodafone’ who also set a new overall record. I was seriously impressed with the Eliott 35ss it was extremely FAST, easy to sail and I was also surprised to hear how affordable it was. I imagine there will be a few more of these built in the near future. Our video of the race https://vimeo.com/51989160. And a photo album with some great shots of us just after the start.